My grammar is probably incorrect but the sentiment is true. I bloody love it! Autumn in the woods; that slight chill in the air and a mission to find some elusive and wonderful foods that have been hiding all year. Carluccio calls it “the quiet hunt” and when I’m not running a course and therefore talking my way through the woods, that’s exactly what it is. A quiet, careful, sense stimulating treasure hunt. It’s mid October, slap bang in the middle of the season and so far it’s been a pretty good year for Autumn fungi, edible or otherwise, despite the lovely hot Summer preventing some of the early fruiting species coming out to play. Around this time of year I always see a lot of incredibly lazy desk top journalism, claiming all the wet weather, or the hot weather or whatever weather we have had, is good for mushrooms and we are having a bumper year. The fact is, what’s good for one isn’t so good for another, so if you know what to look for its always a good year, and a bad year if you don’t. My birthday at the end of June is usually blessed with a bounty of wild Oyster Mushrooms. This year not a single one showed up for the party. As with most truly wild foods, “Oysters” don’t taste like the version you buy in the shops, in fact their wonderful subtle taste reminds me of fried eggs or fresh noodles more than of mushrooms. On the subject of wild verses farmed foods, I picked up a packet of pathetic looking “wild” spinach in a shop recently and read that it was farmed in Kent…is it just me or is this confusing? Anyway, to get back to all things fungi, it is not too late to take to the woods and find a selection of the late season gourmet delights. I strongly recommend you do this with someone who knows their stuff and also I would suggest getting out of the city for two main reasons. One, it’s lovely out in the woods right now and two, city fungi can really absorb a lot of pollutants, heavy metals, fumes etc. Natures grand disseminators, they are constantly at work absorbing, breaking down and neutralising toxins so just like finding a clean beach to gather your seafood or seaweed from, with fungi, seek out an area away from any pollution. The top rated Porcini mushroom (aka the cep, the penny bun or to give it it’s latin name Boletus edulis) has had a funny year, some claim to have picked bumper crops but for me I have generally found only a few, and not growing where I’d normally expect them. Ceps aside, now is the time to hunt for three of the most tasty types; The Trooping Funnel Cap (Latin name Clitocybe geotropa), The Winter Chanterelle (Cantherellus infundibuliformis…..yes , it’s really called that) and The Hedgehog Fungus (Hydnum repandum) all of which are starting to pop up and should be with us for the next month or so….with a little help, all are easy to recognise and relatively hard to confuse with anything potentially dangerous (even so, not for beginners especially the funnel which has some very nasty relatives). As well as my own season of walks, I have continued running some mushroom courses for fellow foragers, Frazer Christian at https://www.wildforage.co.uk and Robin Harford at https://www.foragingcourses.com . I have also run some very enjoyable days for Luke at www.white-pepper.co.uk , an award winning cookery school in Dorset. 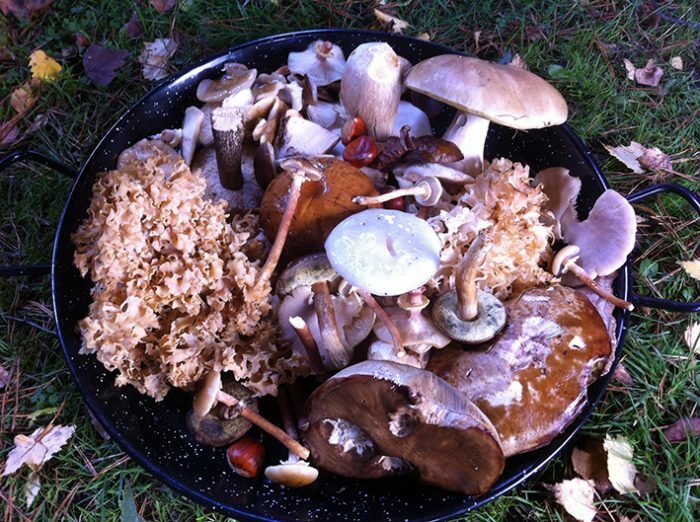 The photos above are of a fabulous fungi mix we gathered on our walk last week and that Frazer made into an enormous wild mushroom risotto ( Ceps, Bay Boletus, Oyster Mushrooms, Cauliflower Fungus, Honey Fungus and a few others too). It’s easy to think that Autumn is the only time to hunt for mushrooms but with the right knowledge or the right guide there is something interesting to eat most of the year, from the enormous Oyster mushrooms I picked in my local park on Christmas day (see the picture in my Facebook gallery),to Field and Horse Mushrooms sometimes around as early as mid Summer, to the caramel tasting Velvet Shank (Flammulina velutipes) I found on an elder tree in Dorset on a freezing February day earlier this year, right through to the Winter Chanterelles that I have gathered frozen from under a thin crust of snow (I don’t know any other mushrooms that cope with the cold like this). Although I normally just fry mine with a little salt and pepper, below is a wonderful, delicious and very simple recipe courtesy of Luke at White Pepper. There are still a few good weeks left of the main season so get out there if you can and I hope your efforts and mine are well rewarded. Happy hunting. 1. Cut the liver into small pieces. 2. Heat the butter and oil in a frying pan and wait for the foam to go quiet, then add the liver. 3. 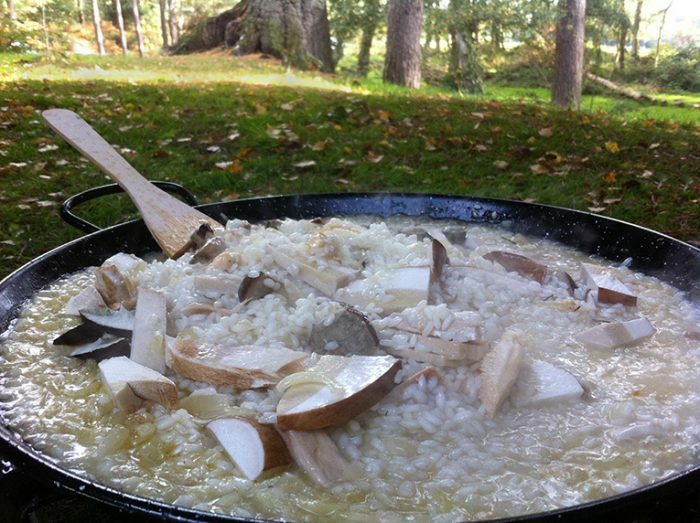 Cook quickly to change the colour then add the mushrooms and cook until golden. 4. Season with Gremolata ( optional ) and salt and pepper. 5. Pour in the alcohol and warm briefly before lighting. Shake until the flames die down. 6. Turn the heat down before adding the Crème Fraiche . 7. Bring to the boil and reduce, if necessary, to a coating consistency. 8. Adjust the seasoning as required. Love mushrooms as much as you but is there not a danger that too many people collecting too many fungi will damage their survival prospects? Next post: Spring Time! In November? Previous post: Brilliant Berries (ridiculously tasty recipes ideas).